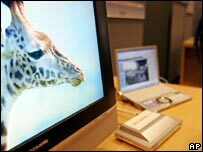 Three-quarters of UK online households will connect to the web via broadband by December 2006, analysts predict. Jupiter Research says faster speeds will help drive user-generated content such as YouTube and photo site Flickr. But while uptake has helped the UK to the broadband fast track, lack of speed compared to other countries could still see it derailed. Experts warn the UK is falling behind its European counterparts when it comes to speed. High-speed net access has become as necessary as electricity or water to many. It has been a remarkable take-up of a technology five years ago many had not even heard of, let alone thought they couldn't live without. But what impact is it actually making on lives? Has it, as predicted by some, transformed the way we use the web, and by association our lives, or is it simply a means of doing what people have always done online but faster. Broadband is certainly holding our attention - with high-speed surfers spending around six hours more online each week than those still using dial-up. But there has yet to be a sea-change in the things they do online. E-mail remains the most widely used application with surfing for information and shopping being the most widespread internet activities, according to findings from research firm PointTopic. The average online customer is spending £1,290 per year online, according to PointTopic. Some had predicted that this year could see an explosion in the use of online video and net telephony but according to PointTopic these applications are making an impact in less than 10% of online householders. Increasingly, broadband is allowing people to contribute back to the net rather than just being passive downloaders of content. Firms such as Google are so excited about the future of user-generated content that they are prepared to pay billions for a slice of the action. But if such content is to take off it will need faster speeds to enable people to upload pictures and video effortlessly, thinks Jupiter analyst Ian Fogg. "The speeds that are available in the UK are lagging a long, long way behind other European counties," he said. In the UK the fastest speed currently on offer is 24Mbps (megabits per second) although typically the fastest people will get is about 8Mbps. French surfers are enjoying around 24Mbps as standard. BT does not plan to roll out its next-generation broadband until the middle of 2007. Last year saw a flurry of announcements about faster and faster net connections courtesy of next-generation broadband - ADSL2 - which promised speeds of up to 24Mbps for everyone. It was a promise that PointTopic was sceptical about at the time - warning that as few as 5% of the UK population would actually get speeds above 18Mbps. The Advertising Standards Agency has also questioned internet service provider's inflated claims about speed. Speed is no longer the way providers are trying to capture new customers. In its place has come a new price war with internet service providers competing to offer free broadband bundled with telephone services. Who actually thought you would get better broadband by allowing cowboy operators into telephone exchanges? Carphone Warehouse offers one of these packages and has seen its subscribers leap from 100,000 at the end of March 2006 to 247,000 by end of July. Its free broadband service was made possible on the back of local loop unbundling, which may not be a term that comes readily to many people's lips. LLU means rivals to BT can install their equipment in telephone exchanges, which allows them to offer cheaper and innovative services without relying on the telecoms giant. But Carphone Warehouse has had problems coping with demand as the process of local loop unbundling can be complex and slow. Of the 625,000 customers who have signed up for its free broadband service, only 20,000 are on unbundled lines, said Mr Fogg. The flurry of cheap or free offers and the subsequent problems people have had getting their service will ensure that price, quality of service and quality of network remain the three most important factors for people looking to upgrade to broadband, he thinks. Since broadband began making its impact on the UK net market there have been concerns that there could be a divide between those with access to high-speed services and those without. The nature of local loop unbundling has meant that it is much more attractive for companies to offer services in areas of high populations - ie towns and cities - because it maximises profit. It means those in remoter areas are still missing out on the super-fast speeds their urban cousins are enjoying. While broadband is now available to around 99% of the UK, PointTopic predicts that around 30% of the country will not access the cheaper, technically more sophisticated services that LLU allows, opening up a new digital divide. 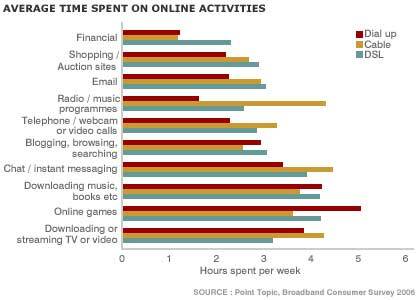 Broadband Britain is perhaps not as healthy as it first seems. A series of reports on Broadband Nation will be shown on BBC One's Six O'Clock News over the next three days.